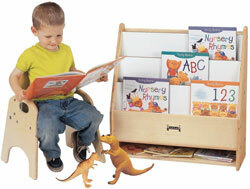 Book display stands for schools, libraries and daycare centers. All mobile and stationary units are made of Baltic Birch plywood. Non-toxic, non-yellowing finish. Scroll down to view entire selection of book display stands. 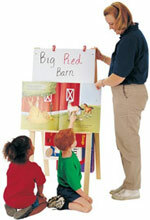 Choose from 4 display fronts: Write-n-Wipe, Flannel, Chalkboard or Magnetic. Partitions & storage in back. 64 linear feet of book display. 32 linear feet of book display. Write-n-Wipe partitions. Five display shelves. Write-n-Wipe partitions. Storage & display in back. Write-n-Wipe partitions. Display shelves on both sides. Write-n-Wipe partitions. Four generous shelves. Accommodates magazines and tall books. Four book bins plus extra storage below. 8 display shelves plus 8 deep bookshelves. 2 sided access, book easels on both ends. Write-n-Wipe surfaces. Book shelves & storage in back.